We now offer a plugin to help you do this. If you activate the Liveblog plugin, you’ll be able to mark certain posts as live blog posts. This will add an interface for the author to make short posts to the live blog without having to use the normal back-end WordPress editing interface. Readers will see updates appear on the post page without needing to refresh their browsers. This video covers how to use the plugin in practice. 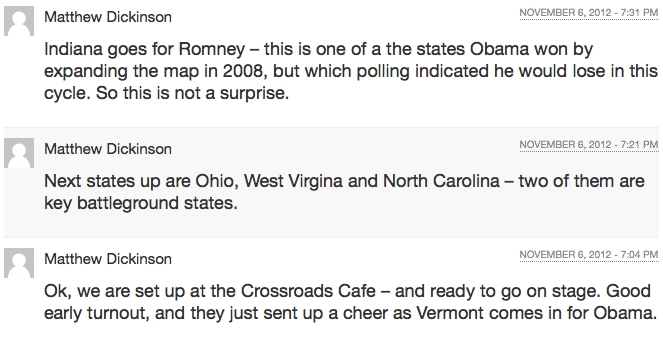 As an example of this plugin in use at Middlebury, Professor Matt Dickinson used it to cover the US election returns on his site. This entry was posted in LIS Staff Interest, Middlebury Community Interest and tagged plugin spotlight, WordPress on January 10, 2013 by Ian McBride.